2019 European Women In Construction & Engineering Awards Finalist | Building, Construction, Engineering & Property Development | Heron Bros Ltd.
Heron Bros is delighted to announce that our CR Manager, Shauna Young, has been shortlisted as a finalist for the European Women In Construction & Engineering (WICE) Awards. 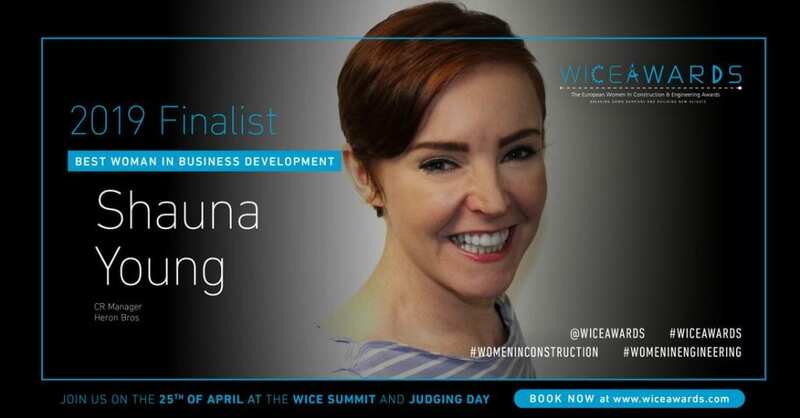 Shauna has been selected from over 400 entries as a finalist for the ‘Best Woman in Business Development’ category due to her truly exceptional individual contributions to the construction and engineering industries. Women represent only 11% of the construction workforce in the UK and most of these jobs are office based and only 2% work in manual jobs. The aim of the awards is to make these industries more enticing to women. To create role models for women considering a career in these sectors, while encouraging companies to employ and train more women in these industries.